Portrayed below is a complete and self-contained NEC model of one popular form of the end-fed half-wave dipole antenna. Applying a feed to any antenna in NEC or any electromagnetic simulation software is about a simple a task as can be conceived by placing a “source” of near infinitesimal size inline with a dipole element. Coax? No worries. Impedance? Use a current source. Examples and discussions exist here, here, here, and here. While perfectly fine for various studies, this leaves the trickiest part out of the equation… namely how to change a 50 ohm feed impedance to that appropriate to feed the high impedance end of a half-wave dipole. This study includes the physical model of just such a step-up transformer providing a way to use a 50 ohm source. FDTD – Finite-Difference Time-Domain method: Actually calculates Maxwell’s equations in time step offering movie like views of the progression of both electric and magnetic fields. Very slow, often high cost software, but very complete and very cool. NEC – Numerical Electromagnetics Code method: Uses Method of Moments technique to calculate steady state currents of each wire segment. Relatively fast, often low cost or free software and offers an easy entry into antenna simulation. Since NEC is available to so many, it got the nod for this project. So now what front end to use. Of the numerous “front ends” available to run NEC, EZNEC and 4nec2 seem to be at the top of the stack. The recent versions of EZNEC include a transformer emulation capability that might be of interest to end-fed experiments. 4nec2 pretty much relies on whatever the underlying NEC can provide. It truly is a front end to the command-line NEC executable programs. This is actually an advantage for 4nec2 since improved or optimized NEC executables instantly upgrade its speed and computational power. Such is the case with the availability of NEC-MP that recompiles NEC into a truly multi-threaded program. This takes advantage of machines with spare threads and speeds up NEC computations enormously. Another advantage of 4nec2 is the ability to parameterize dimensional and RLC values to perform optimization and evolution techniques to play “what if” with great ease. One disadvantage of 4nec2… it’s buggy as hell and great care must be applied to watch out for issues. Regardless, 4nec2 gets the nod for this effort. Simulation packages such as EZNEC offer special transformer simulation. Sounds very handy and I look forward to learning how this works someday. However, I wanted to study the behavior of the entire system including the winding of the step-up transformer rather than rely on an idealized version of same. Years ago I took an antenna class from Dr. Stephen Best who was kind enough to field questions after the class. At that time I was designing an improvement to the Super J antenna to replace the Franklin stub with a coil. I knew much could be accomplished in NEC using an inductance inline, but asked him for tips regardless. He said “Why not just simulate the inductor as wires along with the rest of the model?” I did and it worked well. Of particular significance is the ability of NEC to provide a better realization of a coil than any idealized and perfect inductor. Time to make the model. Taking the lessons from the Super J and Dr. Best, I set about to simply design a helical step-up transformer at the end of a half-wave antenna element. It took some trial and error with the tools available in 4nec2, but wound up with this design in figure 1. 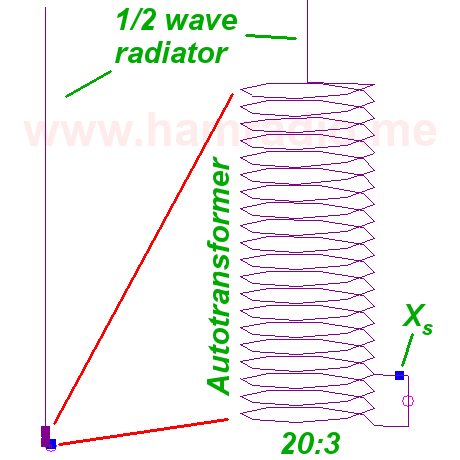 Figure 1 – The end-fed half-wave dipole antenna with magnified view of transformer. Approximately one half wavelength of straight wire from the antenna top to the top of the transformer winding. 20:3 step-up transformer in the autotransformer configuration. Various ratios were tried until discovering 20:3 produces close to 50 ohms (for this particular situation). The transformer configuration produces an inductive component at the 3rd tap wire. A reactance, Xs, is in series between the source and the primary winding to provide the means to compensate for this. This is a core-less air transformer (or “air core” if you like) just in case that isn’t obvious. That series reactance is most often a capacitor in series. It’s what one finds in end-fed VHF and UHF antenna systems from Diamond Antenna and others. One example is the NR770HBNMO end-fed dual band mobile antenna and companion K515S Luggage Rack Mount groundless mount. Numerous web sites reveal the coil and series capacitor of these antennas. Figure 2 – The transformer converting 50 ohms to the thousands one needs to drive the current node of a dipole. I probably am using the term counterpoise incorrectly, but there is so much variation in its use, oh well. Owen Duffy suggests avoiding the term and I cannot disagree, but for the sake of this discussion I’m simply referring to any additional conductor beyond that of the EFHW antenna system (whip, coil, reactance and source). Cool? Alrighty then let’s move along. Figure 2 gives a bit more detail highlighting the location of the source and reminding us eventually something will connect to the feed point and provide a bit of counterpoise. However one point for this particular effort was to prove to myself this can work without need of a purpose-built counterpoise system or other conductors. Hence the wire in light green does not actually exist in the simulations for this article. 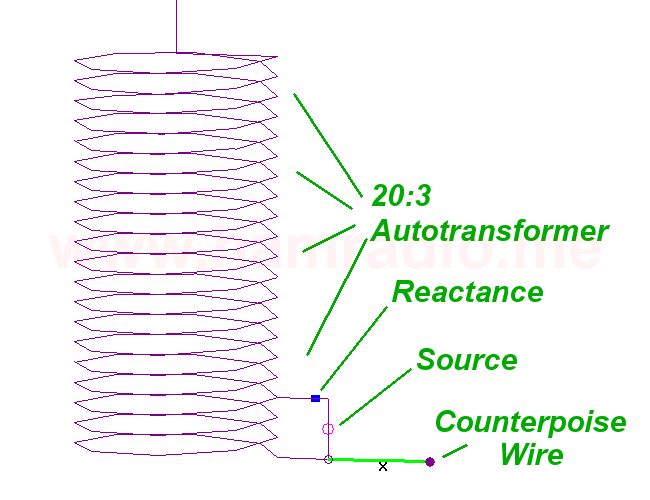 Okay yeah the little bit of wire coming out from the transformer to meet the source and reactance do provide a little bit of counterpoise, but to what effect. Hint, the effect of the extra wire will be covered in depth in a forthcoming article. Figure 3 – Final impedance after insertion of series capacitor to offset inductive reactance of the end-fed half-wave dipole antenna. Figure 3 shows the resistance and reactance as seen by the source as configured in figure 1. Pretty darn nice if you ask me. 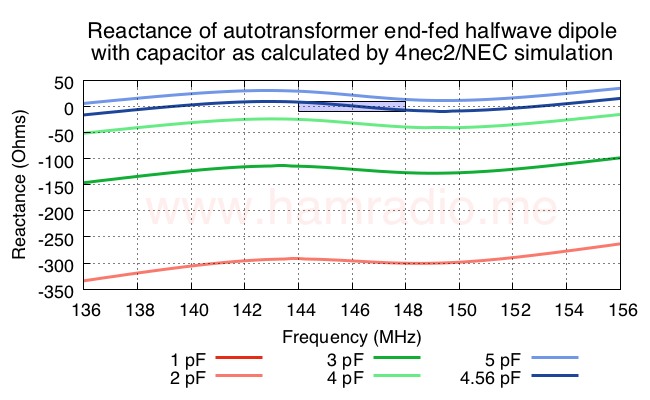 The resistance swings quite close to 50 ohms thanks to the “turns ratio” of the autotransformer. The reactance hovers near zero thanks to the compensating series capacitance. Let’s explore more about that series compensating capacitance. Figure 4 – Resulting inductive feed point impedance with no series capacitance. 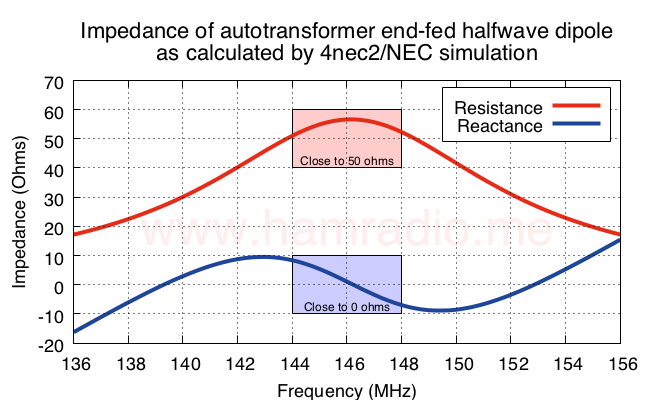 The combination of the transformer with the end-fed dipole results in a positive reactance. This suggests an inductive reactance. The resistance (real) component of the impedance is right where we want it near 50 ohms. This reveals we only need to compensate for the reactive component. A series capacitance, Xs in figure 1, is the easiest approach for this example. Knowing we need a Capacitive Reactance, we can review the definition to take the next steps. Compensating for +237 ohms merely requires an offsetting -237 ohms from the capacitive reactance. We head to the formulas where Xc stands for Xs. We swap Xc and C and make Xc = 237 ohms and f = 146,000,000. 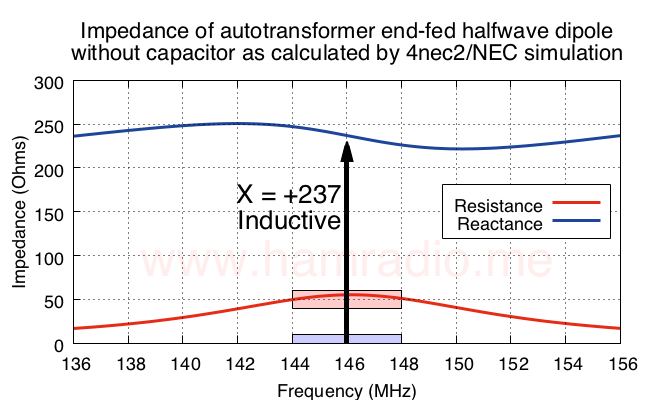 Solving for C results in a capacitor of value 4.59 pF to provide the -237 ohm reactance to compensate for the antenna/transformer inductive reactance. Let’s see what happens to the real value resistance of the antenna system as we dial in the correct capacitance. Figure 5 – How the series capacitor affects the feed point resistance. As one expects, the real value of the inductance changes little with the varying series capacitance. It is most perturbed with the 1 pF value, but settles in as capacitance gets well beyond the “mere open gap” values. More about 4.56 pF in a moment. Figure 6 – How the series capacitor affects the feed point reactance. The final reactance presented to the source varies wildly as capacitance increases from 1 pF to our goal. 5 pF overshoots a bit as we expect. Simulation optimizations reveal 4.56 pF brought the net reactance to zero ohms. This is very close to our predicted value… pretty much a bulls eye. There are some parasitic capacitances in play as well, but this result offers good agreement of theory and simulation. 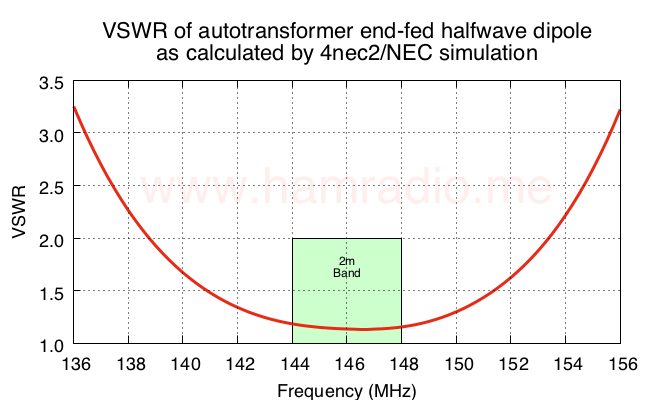 Figure 7 – VSWR of end-fed half-wave dipole antenna. Figure 8 – Return loss of end-fed half-wave dipole antenna. 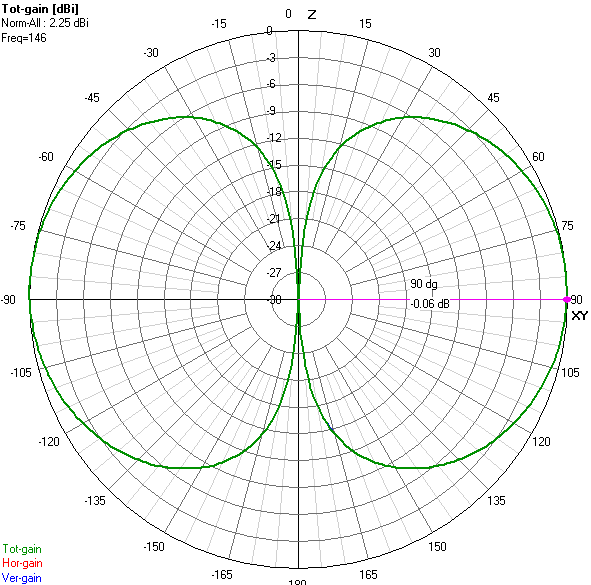 Figure 9 – The resulting current distribution of the end-fed half-wave dipole antenna. or “other half” of the antenna to <cough>push against</cough>. For those that might be interested, the peak value of current in the middle of the dipole confirms the 100 watts form the source winds up on the element. This assumes the mid point impedance is about 70 ohms. Thus the energy from the source finds its way to the dipole for radiating. The 0.967 AGT (-0.15 dB) from the NEC4 simulation indicates enough deviation to account for the overly ambitious 2.25 dBi value of the gain shown in figure 10. The compensated gain comes to about 2.1 dBi, close to a perfect dipole’s 2.15 dBi gain. Further tweaking of the model can likely improve this, but that’s beyond the larger point of this article. Here is the 4nec2 model file with .txt appended (you’ll need to remove .txt) for you to play with. This was optimized with NEC4. 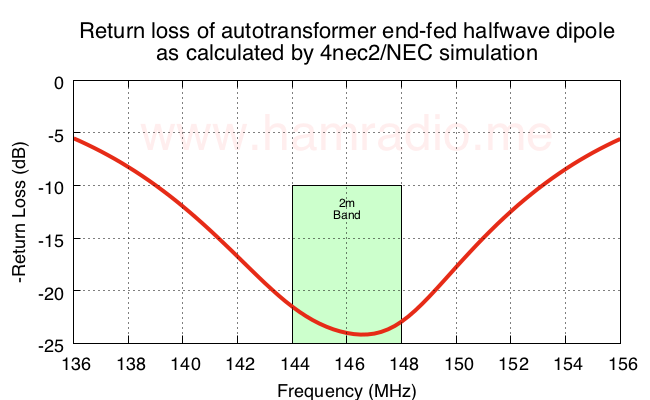 The goal for a wire model of an end-fed half-wave dipole antenna with no special simulator tricks (like EZNEC’s transformer function) is achieved. 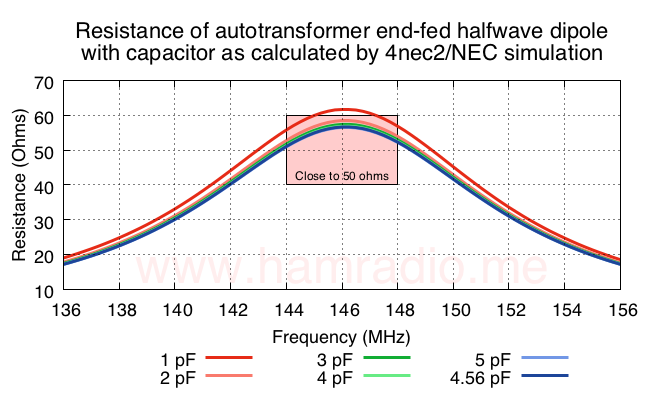 The impedance conversion function of the wire helix autotransformer is no problem for NEC4 although annoying trial and error were required to find the 20:3 ratio that worked well in this mathematical world of simulation. A bunch of wire and a series capacitance can yield an EFHW antenna. Yes this is a closed system of perfect conductors so of course the energy moves through the model well, but the success of keeping return loss managed suggests this is a viable antenna topology. As a result, antenna manufacturers abound with models pretty much like the above. This shouldn’t be news to antenna professionals. One can hope this information helps offset some of the “other half” and “push against” points seen in the great EFHW debates found on The Zed and other amateur radio watering holes. Wow. I am impressed with the well written article, the effort to develop the transformer coil and the handling of the reactance. However, the model is not what I would publicize yet because of the very poor AGT value. Some more work is needed to see what is wrong or even if NEC2 can handle it. Maybe take a look at what is generating the 135 MHz secondary resonance. Points well taken. I found 0.967 AGT with NEC4. I guess I should have a look at NEC2 results as well. I've never been too sure how far off AGT can be before trouble begins. What I really want to do is actually make the thing, but I'm busy with another EFHW experiment at the moment. If you find a design tweak that yields better results with NEC2 please consider sharing.